This version of the 24-70mm is the long awaited—and many say overdue—replacement for Nikon’s mainstay mid-focal range zoom. If you’re familiar with the older version of the lens (24-70mm f/2.8G), you might be initially disappointed with a number of the changes that were made. The new 24-70mm f/2.8E version is 5mm wider in diameter, and .8” (21.5mm) longer. It also gained 6.7 ounces (170g) in weight. With the lens hood on the lens sticks a full 8” (~200mm) out from the camera mount, putting it in small telephoto range in terms of size. Also, we’re now up to 82mm filters on the front of the lens. A lot of things didn’t change. The maximum reproduction ratio didn’t change, though there’s a small change in close focus distance at the extreme focal lengths, not enough to worry about. The lens is still internal focusing, still has a 9-blade aperture diaphragm, still has multiple aspherical and ED elements, still has Nano coating, and despite the physical changes, sure looks a lot like the original lens. What’s different is substantive, though. First up we have electronic aperture (the E instead of G in the designation). The aperture is closed via electronic communication, not a manual aperture activation arm. This means that earlier Nikon SLR and DSLRs aren’t good candidates for the new 24-70mm. Specifically, the F6, D1 series, D2 series, D40, D40x, D50, D60, D70, D70s, D80, D90, D100, D200, and D3000 bodies can’t control the aperture on this lens, you can only shoot wide open with them. But on recent Nikon DSLRs the electronic aperture activation is not only more precise, but many of the cameras can control the aperture for video in a better fashion (called Power Aperture by Nikon). The optical design is decidedly more complex, with 20 elements in 16 groups compared to the older 15 elements in 11 groups. Moreover, the 24-70mm f/2.8E is one of the lenses designed with Nikon’s new optical architecture, one that has befuddled a lot of people trying to measure performance solely with flat test charts at close distances (more on that in the performance section). Like most of the pro Nikkors, the focus ring is to the front of the lens, the zoom ring at the back (towards the camera). The lens is marked with 24, 28, 35, 50, and 70mm points on the zoom ring. The focus indicator does not have DOF or IR markings on it, and provides only 1.5. 2, 3, 5 foot and 0.38, 0.5, 0.7, 1, and 2 meter marks (as well as infinity). Like all ED glass lenses, these markings should be taken with a grain of salt, as temperature impacts actual focus distance. The build of the lens is rock solid. Build quality is Nikon's old pro level brought a bit more into the 21st century. Plus Nikon added their Flourine coating on the front element to better resist water, dust, and smudges. Surprisingly, the lens isn’t listed as weather resistant, though there is a small rubber seal at the lens mount. Nikon’s page for the lens is here. The lens is made in Japan, and sells for US$2400. Source of the review sample: B&H loaner lens. Results compared to no other sample lenses available to me. This is because an inner barrel moves in and out as you zoom, reaching its furthest forward position at 24mm. While that inner barrel is moving, the lens hood isn’t. That means that the overall length of the lens with hood mounted doesn’t change while zooming, a nice touch. It also means that the lens hood coverage at 24mm is fairly scant, though. On my sample both the focus and zoom rings are very smooth, though a bit noisy (that low gravel type sound common among the Nikon pro zoom lenses). The zoom ring manages wide to telephoto in about a quarter of a turn, the focus ring makes it from 1.2m to infinity in a bit less than a quarter turn. For so little focus ring rotation, I did find that I could dial in manual focus very well, something I can’t always do with some of the Nikkors with short rotations. The big thing about this lens is, well, it’s big. On the D4/D5 type body, you end up with a very heavy package, but it’s well balanced and the size seems appropriate. On the smaller bodies (D610, D750, D810), the lens feels much more out of place and dominating for its fairly narrow focal range. The 24-85mm feels much more appropriate on the D610/D750/Df bodies, though, yes, you’re giving up significant aperture to get an appropriate size. Autofocus: After spending so much time with the f/1.8G primes recently, the 24-70mm f/2.8E was just a joy in terms of autofocus. On my D5 autofocus has a snap to it that’s much appreciated. No small delay before moving, no measurable move time. Instead of the buh-zip, buh-zip thing I’ve been writing about, the 24-70mm is snap, snap for smallish focus changes and zip, zip for long ones. Pretty much exactly what we expect from a high performance lens. Tracking performance also seems to be quite good. Again, exactly what we want in this type of lens. Sharpness: Yes, we have improvements. There’s a bit of field curvature at 24mm, so be careful how you evaluate it, but in real life testing, things are decidedly improved over the older lens. First, most of the time the new version simply performs better than the old version, both in the center, but especially in the corners. At 24mm wide open I can almost say that the edge-to-edge performance is excellent, which is a big step forward. 50mm might be about the worst focal length, but even it is usable edge-to-edge wide open (I should note that I saw some slight de-centering as I zoomed, which impacted one edge more than the other). Best aperture is probably f/5.6 across the board, but at 24mm the increase in resolution is minimal, while it’s more observable at the telephoto end. Overall, the lens performs quite well wide open and doesn’t get all that much better by stopping down. Nikon paid some attention to the way we use such a lens. Personally, I’m now comfortable with using it wide open, whereas I wasn’t with the previous version. Vignetting: A bit more than a full stop in the corners at 24mm, a bit less at longer focal lengths. This isn’t terrible performance, but unlike a lot of Nikkors, you still get improvements even stopping down to f/8. I would tend to say that vignetting is mostly ignorable from f/5.6 on, but just remember that there is more improvement to be gained. I only briefly tested on a DX body, and I’d say vignetting isn’t an issue there. Linear Distortion: The usual story: barrel distortion at 24mm, pincushion distortion at 70mm. The cross over where we get no or minimal distortion seems to be at about 33mm. At the wide end, the barrel distortion is more than 1%, so you’ll definitely want to correct that. It seems well behaved, without mustache distortions. At 50-70mm the pincushion distortion is averaging about just under 1%, which you’ll also probably want to correct, though it isn’t obnoxious. Frankly, the 24-70mm has almost no focal lengths I wouldn’t correct for linearity. Even 28mm (barrel) and 35mm (pincushion) have just enough distortion to them that I’d want to correct it if straight lines are important. Chromatic Aberration: Yes, it’s there, and it’s not ignorable except maybe at 70mm. Strangely, it’s worst where the linear distortion is best ;~). But it’s fairly high at 24mm and even 50mm. On the high resolution bodies you’re definitely going to see it, so you’ll be fixing this in post processing if you’re shooting raw. Flare: The lens seems relatively resistant to flare, though you’ll get some modest spots with veiling flare with really bright lights within the image area. I was never a fan of the original 24-70mm f/2.8G. I thought its performance was okay in the center of the lens, but decidedly poor at the edges at 24mm, the focal length I was often using it at. Even stopping down to f/5.6 didn’t bring the edges at 24mm up to anything other than what I might call very good on days when I wasn’t grumpy. The original lens had quite a bit of linear distortion and vignetting, too. On top of all that, it didn’t feel “special.” If you’re going to pay US$2000 for a lens, something about it ought to feel special, don’t you think? Which brings me to the current 24-70mm f/2.8E VR. Is it special? One reason why I borrowed a lens for this test rather than buy it outright as I usually do is that I wasn’t sure from the marketing, specifications, and a brief handling of it. Well, I’m still not sure after having used it for a month. Most decidedly the 24-70mm f/2.8E VR is an improvement over the older lens. Better edge-to-edge sharpness and continuity, for one thing. 24mm is far better on the new lens than the old, which is exactly where I tend to use this lens most. I suppose if I were doing more indoor sports shooting, I’d be all over this lens. It’s pretty much everything I’d want, though it would be nice if was lower in the chromatic aberration production. I also don’t tend to be shooting 24-70mm where I need VR (or even f/2.8). So here’s the thing. For me the bump in price to US$2400, the bump in front filter size to 82mm, and the bump of 6.7 ounces of extra weight all are deductions from the “specialness” factor for me. The VR isn’t much of an addition for me. Thus, I’m mostly stuck with “this is a much better 24-50mm lens than the old one in terms of sharpness” (at 50-70mm there’s not a lot of difference). That’s not enough “special” to outweigh the demerits in my book. But it may be enough in yours. If you need f/2.8 and you need VR, then suddenly this lens looks far better than the lens it replaces. Still, the Tamron equivalent is about half the price and almost a half pound lighter, too. So you have to consider it, I think. So yes, Nikon improved the 24-70mm and added the feature you all requested. No, that doesn’t make the choice of buying it a slam dunk. 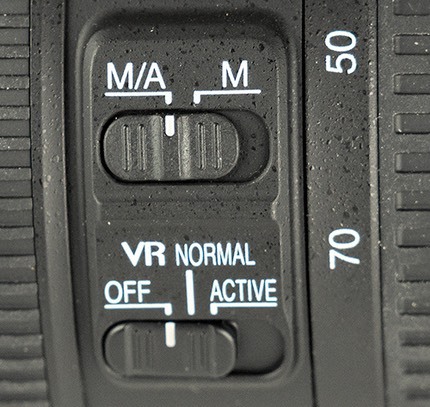 Overall, I think it mostly boils down to how much you value better sharpness at the wide end and the VR, because those are the two standouts in the redesign that are clearly seen. That’s not to say the the new lens isn’t better at other focal lengths, too, only that you’re going to really notice the difference at 24mm, much less so at 50mm or 70mm.